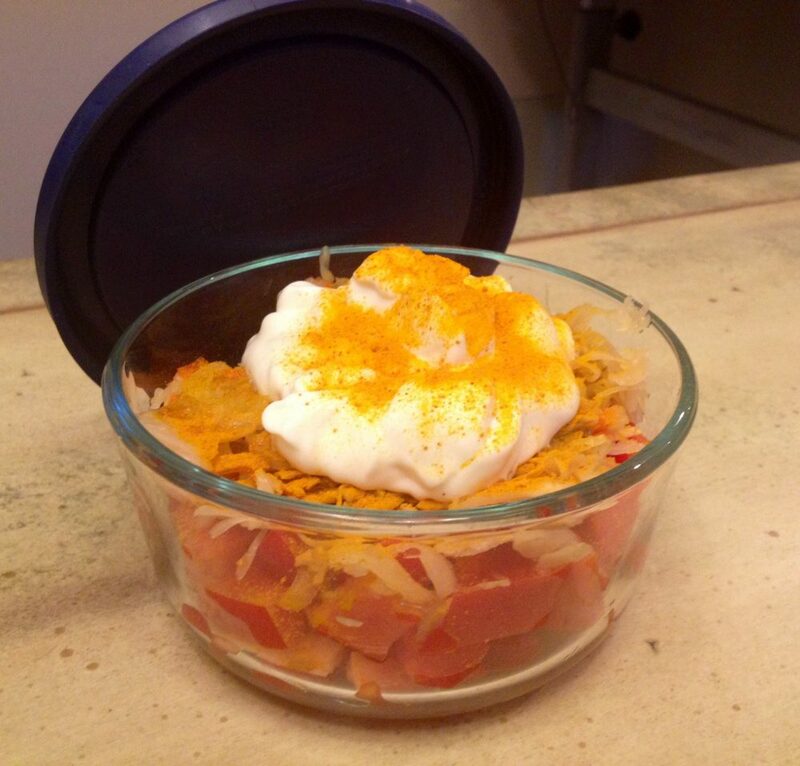 Modding my Chipotle Bowl with 5 ingredients for higher performance. As you all know by now, I’m a wee bit picky when it comes to my food. I want the highest quality and most nutritious goodness for my body and for my family. I want high performance, longevity, and energy. So, to ensure I get all of those things I prepare all of our high quality foods from scratch. That’s no small task as you might imagine, but it matters to me. Sometimes, I need a break, or sometimes we’re traveling and food choices are limited. 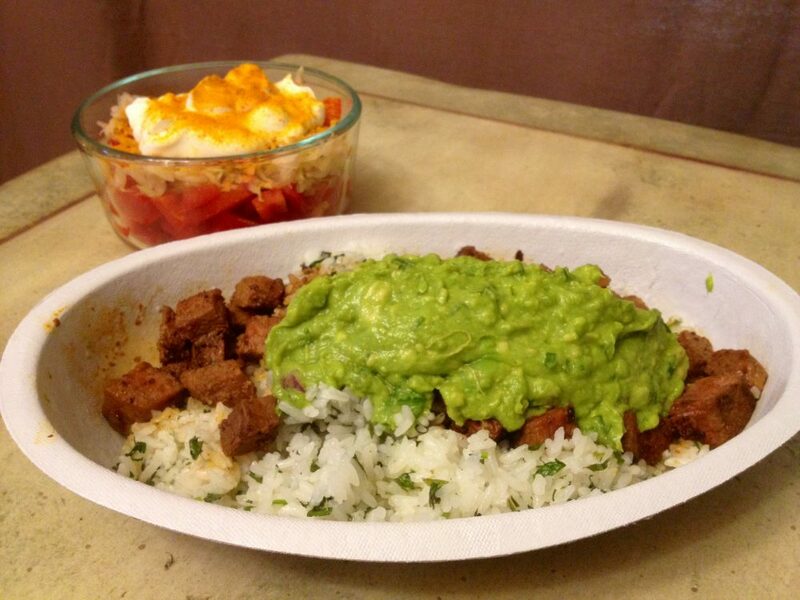 Chipotle Bowl with white rice, steak, and guacamole. It needs to be enhanced. 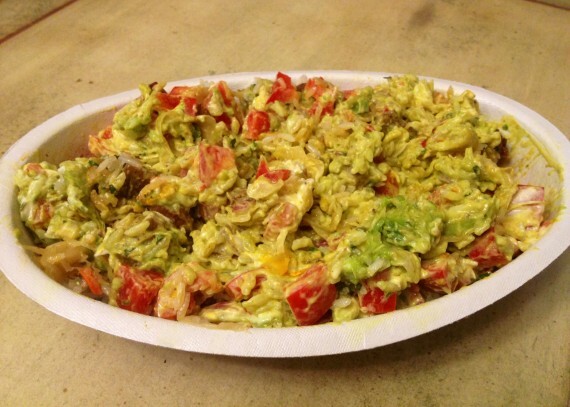 One of the places on our list of “OK to eat” is Chipotle. It’s by no means perfect; but, on the spectrum of fast casual restaurants, they get my vote. They try to source quality ingredients and they listen to their customers. For example, they changed their oil by switching from crap gmo soy oil and now use less-crappy-but-still-crappy rice bran oil due to customer complaints. 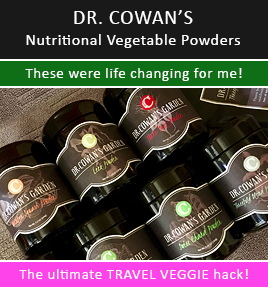 Organic turmeric – fighting inflammation and preventing Alzheimer’s needs to be something people work on while they’re young and turmeric can help with that (read a bit more about that here). Red bell pepper (diced) or celery or green onion or whatever fresh veggie I have on hand to add phytonutrients, fiber, freshness, and crunch. Raw Organic Farmhouse Culture Sauerkraut (the best brand of kraut available) offers beneficial probiotics, nutrients, and fiber. Grass fed Organic Greek Plain Full Fat Yogurt – omg just like sour cream and omg so yummy and omg I love it – and for the nutrition, grass fed greek yogurt has protein, retinol, calcium, iron, iodine, beneficial bacteria, B-vitamins, phosphorous, and more. I put these all in a glass bowl with a lid and head to Chipotle. Then, I buy the Chipotle bowl with white rice, steak, and guacamole, and I dump my extra fixings on top and go to town. It’s totally satisfying and super delicious. 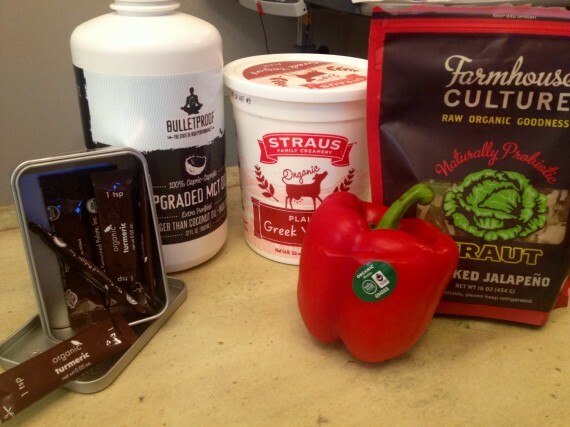 Ingredients ready to go for modding my Chipotle Bowl. * A note about choosing white rice over the so-called “healthier” brown rice. 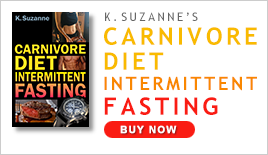 According to Chris Kressers’ new book Your Personal Paleo Code, apparently some studies show that more nutrients are absorbed from white rice over brown rice (gasp!) because brown rice has anti-nutrients (like phytic acid) in it preventing nutrients in the rice from being absorbed. Not only that but brown rice can also reduce dietary protein and fat digestibility. To me that’s good news because I always liked white rice better anyway.